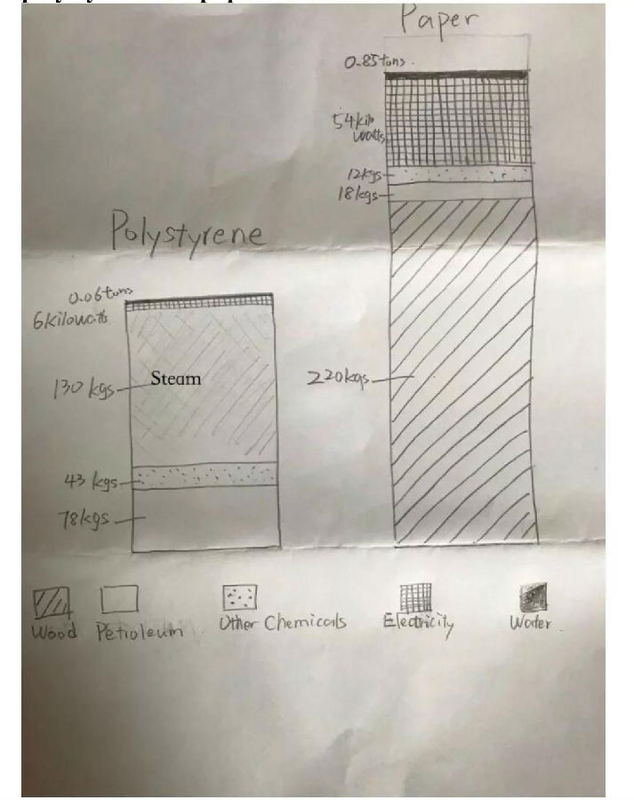 The bar chart illustrates the quantity of different resources consumed to make 1,000 polystyrene and paper cups. To product 1,000 polystyrene cups needs 8 kg of petroleum and 13 kg of other chemicals. These two elements are heated with 130 kg steam, which is ten times as much as other chemicals. This process is rather energy-efficient, only costing 0.6 m3 of water and 6 kilowatts of electricity. However, in the process of making 1,000 paper cups, the usage amount of water and electricity is more than ten times than that in the process of making polystyrene. It also requires more petroleum, more than twice as polystyrene cups. It is worth mentioning that the production of paper cups doesn’t need much other chemicals and steam. The amount of other chemicals is less than two thirds of that in polystyrene cups. Overall, the production of polystyrene cups is environmentally friendly, because it costs less energy and doesn’t need any wood, while 1,000 paper cups almost needs 220 kg of wood. Some people argue that building the underground railway system can ease the pressure on the transport system, while others think building or broadening roads can achieve this. Discuss both views and give your own opinion? It is quite common today for metropolis to build underground rail network to reduce traffic congestion. While building or broadening roads might seem to be a practical suggest at first, I believe, the construction of railway system is a more effective way. There is no doubt that the building of new and wider roads can, to some extent, address the traffic congestion. If wider roads were built in city centers, the road capacity would accommodate more cars to drive at the same time and as a two-lane road becomes a four-lane road, it is less likely for a traffic jam to occur if the number of private cars remains the same. Similarly, were there an increasing number of roads, drivers would have more paths to choose from instead of sticking to the major lane. Therefore, less cars would be stuck at the peak hour when commuting. Constructing metro system is another approach to solve the problem because it attracts more commuters to take it. Firstly, the underground railway is well-known for its safety compared to driving on the roads. Apart from that, when taking underground railway, passengers have the control over the time they arrive at their destinations. For example, a staff whose working hour begins at 9 o’clock can determine the exact time when he should step out of his home after taking the subway for several times. It is the safety and the sense of control that make more people prefer to commute by rail network rather than by car. In my view, the underground rail system is a much better choice. Even though building wider roads and new lanes may have positive effects on traffic congestion, it merely solves the problem for a short time, as the same issue occurs when the number of cars overwhelm the road capacity. The metro system, however, can significantly relieve the traffic congestion by channeling more people to take the public transport instead of driving.